Whether you and your team are challenged by countless runs to meet closure and coverage goals, interactive efforts to validate power domain and reset verification intent, or finding and debugging long deep deadlocks, Incisive® Enterprise Simulator improves turnaround time and throughput. With process automation technology, native high-performance engines, power analysis, and advanced debug capabilities, you can verify the most complex chips and systems. When digital simulation became commonplace in the 1980s, flows were simple: RTL, then gate, then implement. Since then, simulation has matured into verification and has become the critical means to enable productivity, predictability, and quality in complex FPGAs, ASICs, and custom designs. As part of that maturation, what has emerged are new means for generating metrics (to measure the progress against the verification plan), new abstractions for both digital and analog simulation (to move verification earlier in the process), and new methods for speeding convergence. Incisive Enterprise Simulator is the most used engine in the industry, continually providing new technology to support each of the verification niches that have emerged. Today, the simulator fuels testbench automation, reuse, and analysis to verify designs from the system level, through RTL, to the gate level. It supports the metric-driven approach implemented by Integrated Metric Center and the Cadence vManager™ platform. Its native-compiled architecture speeds the simultaneous simulation of transaction-level, behavioral, low-power, RTL, and gate-level models—critical to the verification of modern multi-language, multi-abstraction, mixed-signal SoCs. With Incisive Enterprise Simulator, you can gain a simplified overall debugging effort and shortened debug turnaround time. The simulator separates design failures from simulation failures, sorting and grouping these failures for easy selection and action. Its comprehensive language support enables source-code debug for complex mixed-language SoCs, where it's critical to trace data through multiple blocks of IP to identify and fix errors. Its integrated support for low-power, mixed-signal, and embedded software enables debug for any SoC configuration. Indago™ Debug Platform: Highly integrated across the Incisive platform, the Indago Debug Platform reduces debug time by 50% using automated root-cause analysis and patented predictive analysis methods to take you directly to the cause of bugs across your SoC hierarchy, including your design code, testbench, embedded software, and IP protocols. 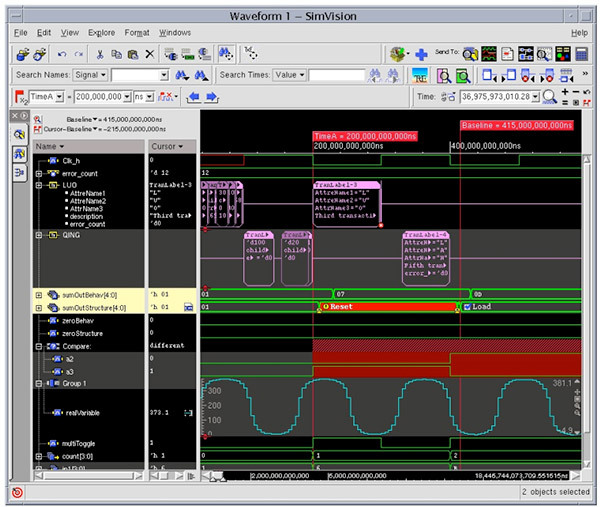 SimVision™ Debug: A unified graphical debugging environment integrated with the Indago Debug Platform, SimVision Debug supports signal-level and transaction-based flows across all IEEE-standard design, testbench, and assertion languages, in addition to concurrent visualization of hardware, software, and analog domains. Incisive Enterprise Simulator supports all IEEE-standard languages, the Open Verification Methodology (OVM), Accellera’s Universal Verification Methodology (UVM), and the e Reuse Methodology (eRM), making it quick and easy to integrate with your established verification flows. You can extend the functionality of the Incisive Enterprise Simulator with our Virtual System Platform, which provides a high-throughput channel between the testbench and the device under test (DUT). This enables automated metric-driven verification of embedded software exactly as if it were another part of the DUT. We adopted the X-propagation support during 2013 to speed our reset simulation performance significantly. The additional automation provided by the Incisive verification platform helps us increase our verification productivity. Chan Lee, Vice President of Engineering, Ambarella, Inc.